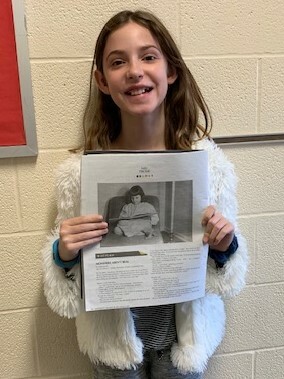 Lindsey Elementary student, Isobel Schulz, won first place in the 2018 Kids’ Prose Writing Contest sponsored by a newspaper located in New Mexico called Pasatiempo. Her piece, “Monsters Aren’t Real,” was featured in a recent edition of the paper as part of the contest. The story features the character of Jaden, a young girl who meets Ceci the monster and is transported into another realm.